Dollar sales in May experienced a seasonal improvement of 6% to $323,274,789 from April’s $305,091,148, up by 12% over last May’s of $289,612,036. The increase over last year confirms a strong spring season. The 12 month moving average line for total dollar sales is continuing to show a very steady upward trend indicating consistent growth. Total Unit sales were up 3% to 1,551 in May from 1,505 in April, an increase of 46. This is up 4% from last May at 1495. The larger rise in dollar sales than unit sales indicates improving pricing, and suggests the lower inventory levels are making it more of a seller’s market. New sales decreased by 3 units to 140 homes this month from 143 in April and off from 134 last year. The price pressure and low inventory levels of new homes suggests a good environment for builders. Used sales were 1,411 homes in May, up 4% from 1,362 last month, an increase of 49, and up by 4% or 50 units from 1,361 last year (Sect E p.3). ACRE numbers are slightly different from those we report. With ACRE, we released our 2015 forecast which can be seen here. ACRE reported: “Forecast: May sales were .8 percent or 1 unit above of our monthly forecast. ACRE’s year-to-date sales forecast through May projected 5,282 closed transactions while the actual sales were 5,260 units, a cumulative variance of .4 percent.” I also expect to see a healthy increase in new construction, which has been quite modest so far..
Total inventory is 1% lower at 10,338 vs. last month at 10,420 and 1% more than the 10,274 last year. Active New listings decreased to 937 in May from 1,274 in April, a decline of 337 units (Sect E p.3). Housing permits were down in Jefferson County to 117 in April from 125 in February, which is down from 119 last year. Shelby County went from 50 to 52 in April, up from 45 last year. I expect this pace to pick-up. We are seeing a more significant number of multi-family construction units (which we do not formally track or report) in most markets. Absorption for Used homes in May shows 8 months which is even with 8 months last year. Used Active listings at 9,401 are up slightly from last month at 9,146 but lower than the 9,462 last year (Sect E p.3). Market performance is highly area specific, so check the individual area charts. For instance, Mountain Brook has about 6 months of inventory except in the over $900,000 category, which has 9 months of inventory (50 homes), with 7 sold in that price range last month . The average days on market for that category is 76. There are a number of MLS areas showing similarly low levels of inventory, including Homewood and Centerpoint. Birmingham area Average Days on Market for New houses is 194 compared with last month at 198. The Used homes DOM was 114 in May vs 122 last month, (Sect A p.18). 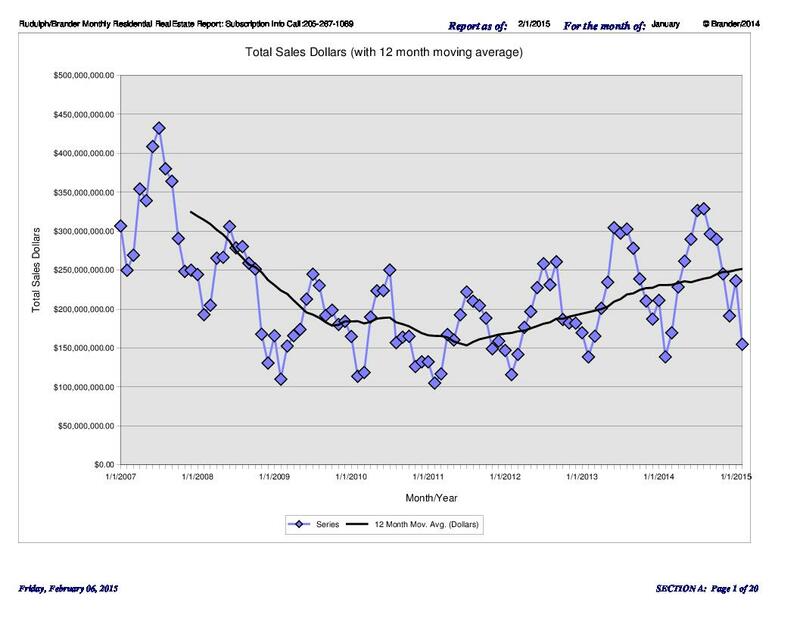 Average sales price for Sold New homes decreased to $287,643 from $314,478 last month (Sect A p2). Average sales price for Sold Used homes increased to $200,570 from $190,984 last month (Sect A p2). The moving average price for all homes has been up steadily for the past year. (Sect A p2). This entry was posted in Absorption, Alabama, Alabama Center for Real Estate, Birmingham, Building Permit, Construction, Forecast, Home values, Inventory, Jefferson County, Monthly comments, real estate, Shelby County and tagged Birmingham Alabama, building permits, Days on market, Housing Statistics, Jefferson County, Monthly comments, Residential Real Estate, Shelby County on June 17, 2015 by Tom Brander. Dollar sales in April experienced a better than expected seasonal improvement of 7% to $292,262,727 from March’s $273,508,424, up by 12% over last April’s of $262,916,981. The increase over last year in the last four months indicates a strong spring season. The 12 month moving average line for total dollar sales is continuing to show a very steady upward trend indicating consistent growth. Total Unit sales were up 4% to 1,439 in April from 1,387 in March, an increase of 52. This is up 2% from last April at 1414. The larger rise in dollar sales than unit sales indicates improving pricing, and suggests the lower inventory levels are making it more of a seller’s market. New sales decreased by 10 units to 132 homes this month from 142 in March and off from 134 last year. The price pressure and low inventory levels of new homes suggests a good environment for builders. Used sales were 1,307 homes in April, up 5% from 1,245 last month, an increase of 62, and up by 2% or 27 units from 1,280 last year(Sect E p.3). ACRE numbers are slightly different from those we report. With ACRE, we released our 2015 forecast which can be seen here. We expect the Birmingham area to be 6% above 2014 levels. So this month’s unit increase of 4% is behind the projection. Based on what I am seeing, I expect substantial market gains. I also expect to see a healthy increase in new construction, the beginnings of which we can see in permits below. Total inventory is 2% higher at 10,281 vs. last month at 10,093 and 1% more than the 10,194 last year. Active New listings decreased to 943 in April from 1,253 in March, a decline of 31 units (Sect E p.3). Housing permits were up in Jefferson County to 125 in March from 98 in February, which is down from 133 last year. Shelby County went from 45 to 50 in March, up from 38 last year. I expect this pace to pick-up. We are seeing a more significant number of multi-family construction units (which we do not formally track or report) in most markets. Absorption for Used homes in April shows 8 months, even with 8 months last year. Used Active listings at 9,338 are up slightly from last month at 8,840 and lower than the 9,363 last year (Sect E p.3). Market performance is highly area specific, so check the individual area charts. For instance, Mountain Brook has about 6 months of inventory except in the over $900,000 category, which has 9 months of inventory (49 homes), with 2 sold in that price range last month . The average days on market for that category is 95. There are a number of MLS areas showing similarly low levels of inventory, including Homewood and Centerpoint. Birmingham area Average Days on Market for New houses is 198 compared with last month at 210. The Used homes DOM was 122 in April vs 130 last month, (Sect A p.18). Average sales price for Sold New homes increased to $317,178 from $291,673 last month (Sect A p2). Average sales price for Sold Used homes increased to $191,580 from $186,418 last month (Sect A p2). The moving average price for all homes has been up steadily for the past year. (Sect A p2). This entry was posted in Absorption, ACRE, Alabama Center for Real Estate, Birmingham, Building Permit, Forecast, Home values, Jefferson County, Monthly comments, Shelby County and tagged Absorption, Birmingham Alabama, Monthly comments, Residential Real Estate on May 12, 2015 by Tom Brander. Dollar sales in March experienced a better than expected seasonal improvement of 27% to $266,141,196 from February’s $210,080,211, up by 17% over last March’s of $227,902,558. The increase over last year in the last three months indicates the beginning of a strong spring season. The 12 month moving average line for total dollar sales is continuing to show a very steady upward trend indicating consistent growth. Total Unit sales were up 21% to 1,348 in March from 1,113 in February, an increase of 235. This is up 10% from last March at 1227. New sales increased by 26 units to 138 homes this month from 112 in February and off from 154 last year. Used sales were 1,210 homes in March, up 21% from 1,001 last month, an increase of 209, and up by 8% or 87 units from 1,123 last year(Sect E p.3). Keeping in mind the ACRE numbers are slightly different from those we report. With Acre, we released our 2015 forecast which can be seen here. We expect the Birmingham area to be 6% above 2014 levels. So this month’s unit increase of 10% is ahead of the projection. Based on what I am seeing, I expect substantial market gains. I also expect to see a healthy increase in new construction, the beginnings of which we can see from the year over year gains in permits below. This month total inventory is 1% higher at 9,740 vs. last month at 9,607 and 3% less than the 10,028 last year. Active New listings decreased to 951 in March from 1,209 in February, a decline of 258 units (Sect E p.3). Housing permits were down in Jefferson County to 98 in February from 101 in December, which is down from 101 last year. Shelby County went from 39 to 45 in February, up from 30 last year.I expect this pace of building to pick-up. We are seeing a more significant number of multi-family construction units (which we do not formally track or report) in most markets. Absorption for Used homes in March shows 7 months, one month better than the 8 months last year. Used Active listings at 8,789 are up slightly from last month at 8,398 and lower than the 9,196 last year (Sect E p.3). Market performance is highly area specific, so check the individual area charts. For instance, Mountain Brook has about five months of inventory except in the over $900,000 category, which has 8 months of inventory (44 homes), with six sold in that price range last month . The average days on market for that category is 121. There are a number of MLS areas showing similarly low levels of inventory, including Homewood and Centerpoint. Birmingham area Average Days on Market for New houses is 210 compared with last month at 209. The Used homes DOM was 130 in March vs 131 last month, (Sect A p.18). Average sales price for Sold New homes decreased to $294,485 from $299,312 last month (Sect A p2). Average sales price for Sold Used homes increased to $186,366 from $176,381 last month (Sect A p2). The moving average price for all homes has been up steadily for the past year. (Sect A p2). This entry was posted in Absorption, Alabama, Alabama Real Estate Confidence Index, Birmingham, Building Permit, Forecast, Home values, Jefferson County, Shelby County and tagged Absorption, Birmingham Alabama, building permits, Monthly comments, Residential Real Estate on April 14, 2015 by Tom Brander. Dollar sales in January experienced an expected seasonal decline of 35% to $154,737,263 from December’s $236,286,564, up by 12% over last January’s $138,585,163. The 12 month moving average line for total dollar sales is continuing to show a very steady upward trend indicating modest and consistent growth. Total Unit sales were down 25% to 873 in January from 1,157 in December, a decrease of 284. This is up 4% from last January at 840. New sales decreased by 86 units to 89 homes this month from 175 in December and off from 91 last year. Used sales were 784 homes in January, off 20% from 982 last month, a decrease of 198, and up by 5% or 35 units from 749 last year(Sect E p.3). Keep in mind the ACRE numbers are slightly different from those we report. With Acre, we released our 2015 forecast which can be seen here. We expect the Birmingham area to be 6% above 2014 levels. So this month’s unit increase of 4% is slightly worse than the projection. Based on what I see I expect pretty healthy market gains. I also expect to see a healthy increase in new construction, the beginnings of which we can see from the year over year gains in permits, below. This month total inventory is 1% lower at 9,101 vs. last month at 9,195 and 9,347 last year. The drop in the current month is caused by month-end expirations which should come back on the market. Active New listings decreased to 912 in January from 1,058 in December, a decline of 146 units (Sect E p.3). Housing permits were up in Jefferson County to 93 in December from 72 in November. Shelby County went from 10 to 41 in December. It seems that builders are anticipating a strong spring market. I think they are right. In addition, we are seeing a more significant number of Multi-family construction units (which we do not formally track or report) in most markets. Absorption for Used homes in January shows 7 months, one month better than 8 months last year. Used Active listings at 8,189 are lower than the 8,495 last year (Sect E p.3). Market performance is highly area specific, so check the individual area charts. For instance, Mountain Brook has about three months of inventory except in the over $900,000 category, which has 6 months of inventory (31 homes) with three sold in that price range last month . The average days on market for that category is 84. There are a number of MLS areas showing similarly low levels of inventory, including Homewood and Centerpoint. Birmingham area Average Days on Market for New houses is 212 compared with last month at 189. The Used homes DOM was 130 in January vs 134 last month, (Sect A p.18). 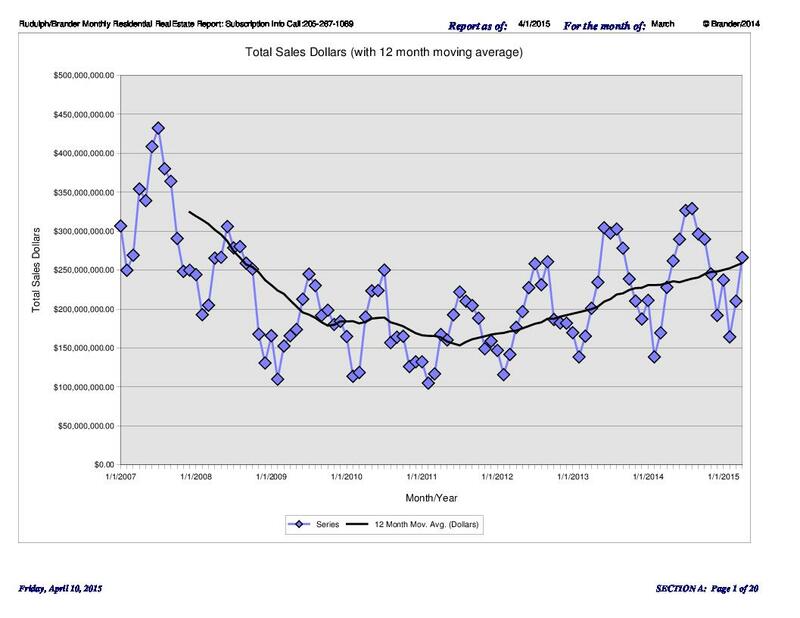 Average sales price for Sold New homes decreased to $295,257 from $310,600 last month (Sect A p2). Average sales price for Sold Used homes decreased to $163,851 from $185,266 last month (Sect A p2). The moving average price for all homes has been up steadily for the past year. (Sect A p2). This entry was posted in Alabama Center for Real Estate, Birmingham, Building Permit, Forecast, Inventory, Jefferson County, Monthly comments, sales forecast, sales projections and tagged Birmingham Alabama, Birmingham Area, Days on market, Housing Statistics, Monthly comments, Residential Real Estate on February 15, 2015 by Tom Brander. Dollar sales in December improved by 23% to $233,754,358 from November’s $190,787,845, up by 11% over last December’s $211,145,543. 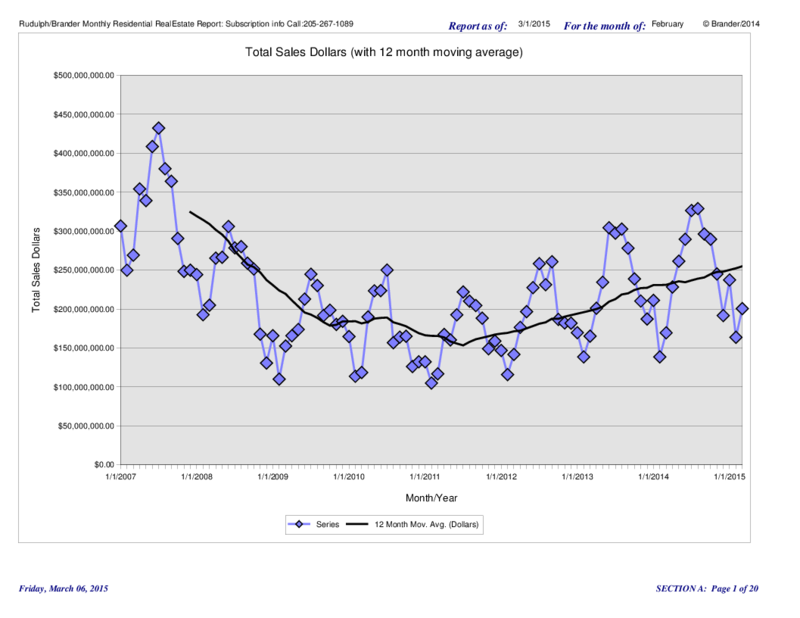 The 12 month moving average line for total dollar sales is showing a very steady upward trend indicating modest and consistent growth. Total Unit sales were up 10% to 1,144 in December from 1,039 in November, an increase of 105. This is up 2% from last December at 1,121. New sales increased by 48 units to 171 homes this month from 123 in November and up from 139 last year. Used sales were 973 homes in December, up 6% from 916 last month, an increase of 57, and down by 9 units from 982 last year(Sect E p.3). Note the higher growth in Dollars (11%) compared to Units (2%) year to year, indicating stronger pricing. Keeping in mind the ACRE numbers are slightly different from those we report, From ACRE: ”Forecast: December sales results were 1.1 percent or 11 units below our monthly forecast. The Center projected 12,845 closed transactions for the market in 2014 while the actual sales were 12,539 units, representing a variance of 2.4 percent.” We determined that the Birmingham MLS is assigning some sales to the Talladega market which were previously reported as part of Birmingham, thus reducing the reported sales in Birmingham, so the forecast is probably a bit more accurate than it appears on a “comparable” basis. With Acre we will be releasing our forecast for 2015 soon so stay tuned. Based on what I see so far I would expect pretty healthy market gains. This month total inventory is 12% lower at 8,689 vs. last month at 9,905 and 9,351 last year. The drop in the current month is caused by month-end expirations which should come back on the market. Active New listings decreased to 815 in December from 1,098 in November, a decline of 283 units (Sect E p.3). Housing permits were down in Jefferson County to 72 in November from 113 in October. Shelby County went from 20 to 10 in November. Absorption for Used homes in December shows 7 months, one month better than 8 months last year. Used Active listings at 7,874 are lower than the 8,487 last year (Sect E p.3). Market performance is highly area specific, so check the individual area charts. For instance, Mountain Brook has about two months of inventory except in the over $900,000 category, which has 6 months of inventory (32 homes) with five sold in that price range last month . The average days on market for that category is 178. There are a number of MLS areas showing similarly low levels of inventory, including Homewood and Centerpoint. Birmingham area Average Days on Market for New houses is 189. The Used homes DOM was 134 in December, (Sect A p.18). Average sales price for Sold New homes increased to $310,781 from $275,989 last month (Sect A p2). Average sales price for Sold Used homes increased to $185,623 from $171,224 last month (Sect A p2). The moving average price for all homes has been up steadily for the past year. (Sect A p2). This entry was posted in Absorption, Alabama Center for Real Estate, Annual comments, Birmingham, Building Permit, Forecast, Home values, Inventory, Monthly comments, sales forecast, sales projections and tagged Absorption, Birmingham Alabama, building permits, Housing Statistics, Jefferson County, MLS, Residential Real Estate, Shelby County on February 1, 2015 by Tom Brander. Dollar sales in October declined by 18% to $233,191,089 from September’s $286,160,779, up by 11% over last October’s $210,290,310. 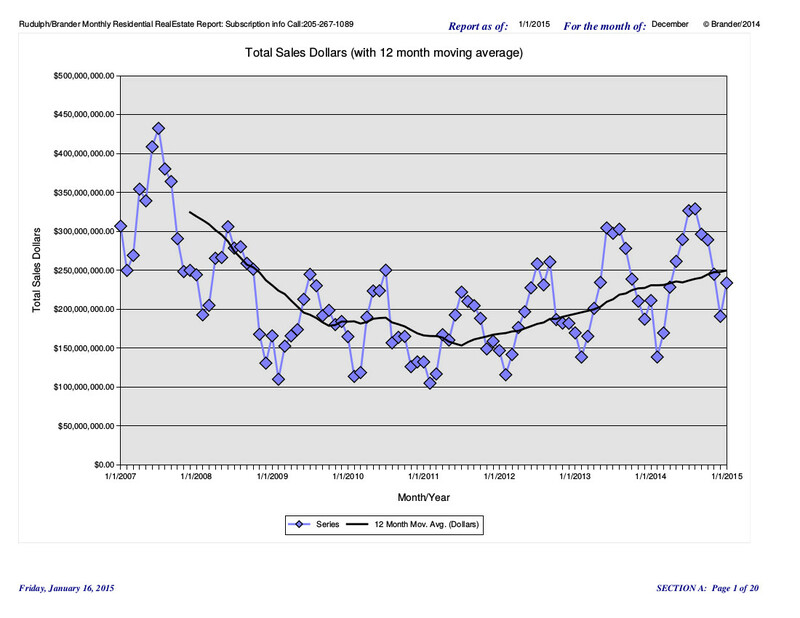 The 12 month moving average line for total dollar sales has resumed its upward trend indicating modest growth. Total Unit sales were down 13% to 1,235 in October from 1,427 in September, a decrease of 192. This is up 2% from last October at 1,205. New sales decreased by 42 units to 133 homes this month from 175 in September and down from 146 last year. Used sales were 1,102 homes in October, down 12% from 1,252 last month, a decrease of 150, and up by 39 units from 1,063 last year(Sect E p.3). Note the higher growth in Dollars (11%) than Units (2%) year over year, indicating stronger pricing. Using the ACRE data and results for forecasting, which are derived in a slightly different method than this report, we forecasted a full year gain of 8% for the full year. As of September the cumulative increase in units is 5%. We determined that the Birmingham MLS is assigning some sales to the Talladega market which were previously reported as part of Birmingham, thus reducing the reported sales in Birmingham, so the forecast is probably a bit more accurate than it appears on a “comparable” basis. This month total inventory is 7% lower at 9,099 vs. last month at 9,748 and 10,519 last year. The drop in the current month is caused by month-end expirations which should come back on the market. Active New listings decreased to 824 in October from 1,070 in September, a decline of 246 units (Sect E p.3). Absorption for Used homes in October shows 7 months, two months better than 9 months last year. Used Active listings at 8,275 are lower than the 9,452 last year (Sect E p.3). The market performance is highly area specific, so check the individual area charts. For instance, Mountain Brook has about two months of inventory except in the over $900,000 category, which has 7 months of inventory (37 homes) with six sold in that price range last month . The average days on market for that category is 82. There are a number of MLS areas showing similarly low levels of inventory, including Homewood and Centerpoint. Birmingham area Average Days on Market for New houses is 225, compared with 197 last month. The Used homes DOM was 125 in October, compared with 127 last month (Sect A p.18). Average sales price for Sold New homes decreased to $280,870 from $287,642 last month (Sect A p2). Average sales price for Sold Used homes decreased to $177,709 from $188,357 last month (Sect A p2). The moving average price for all homes has been up steadily for the past year. (Sect A p2). This entry was posted in Building Permit, Construction, Forecast, Home values, Inventory, Jefferson County, Monthly comments, sales forecast, sales projections, Shelby County and tagged Birmingham Alabama, building permits, Days on market, Housing Statistics, Jefferson County, Monthly comments, Shelby County on November 17, 2014 by Tom Brander.